Sarah Nader- snader@shawmedia.com Gage Hansen, 4, of Harvard sits in a McHenry County Corrections van during Tuesday's National Night Out Against Crime event hosted by the McHenry County Sheriff’s Office and the McHenry County Conservation District Police Department in Wonder Lake August 4, 2015. A motorcycle precision riding demonstration, K9 demonstration and a fire department extrication demonstration were presented at the event. National Night Out (NNO) is celebrated annually the first Tuesday of August. The goal of NNO is to promote crime prevention and safety programs, strengthen police-community partnerships, and encourage neighborhood camaraderie in hopes for a safer McHenry County and America. NNO “America’s Night Against Crime” began in 1984 and is celebrated in all 50 states. 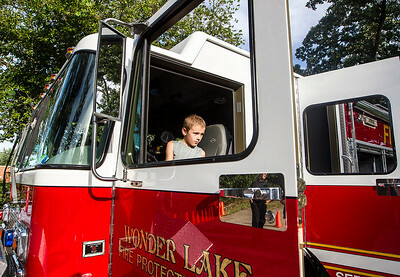 Sarah Nader- snader@shawmedia.com Isaac Morse, 7, of Wonder Lake checks out a Wonder Lake fire truck during Tuesday's National Night Out Against Crime event hosted by the McHenry County Sheriff’s Office and the McHenry County Conservation District Police Department in Wonder Lake August 4, 2015. A motorcycle precision riding demonstration, K9 demonstration and a fire department extrication demonstration were presented at the event. National Night Out (NNO) is celebrated annually the first Tuesday of August. The goal of NNO is to promote crime prevention and safety programs, strengthen police-community partnerships, and encourage neighborhood camaraderie in hopes for a safer McHenry County and America. NNO “America’s Night Against Crime” began in 1984 and is celebrated in all 50 states. 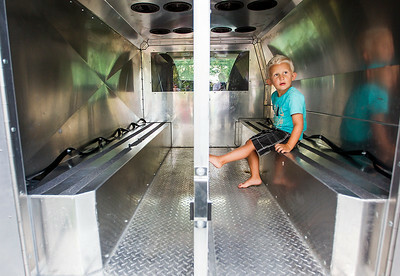 Gage Hansen, 4, of Harvard sits in a McHenry County Corrections van during Tuesday's National Night Out Against Crime event hosted by the McHenry County Sheriff’s Office and the McHenry County Conservation District Police Department in Wonder Lake August 4, 2015. A motorcycle precision riding demonstration, K9 demonstration and a fire department extrication demonstration were presented at the event. National Night Out (NNO) is celebrated annually the first Tuesday of August. The goal of NNO is to promote crime prevention and safety programs, strengthen police-community partnerships, and encourage neighborhood camaraderie in hopes for a safer McHenry County and America. NNO “America’s Night Against Crime” began in 1984 and is celebrated in all 50 states.